William Penn was Granted the Land West of the Delaware River by Charles II in 1680. This Indenture Signed by Penn just weeks after getting the Charter of Pennsylvania on March 4, 1681. 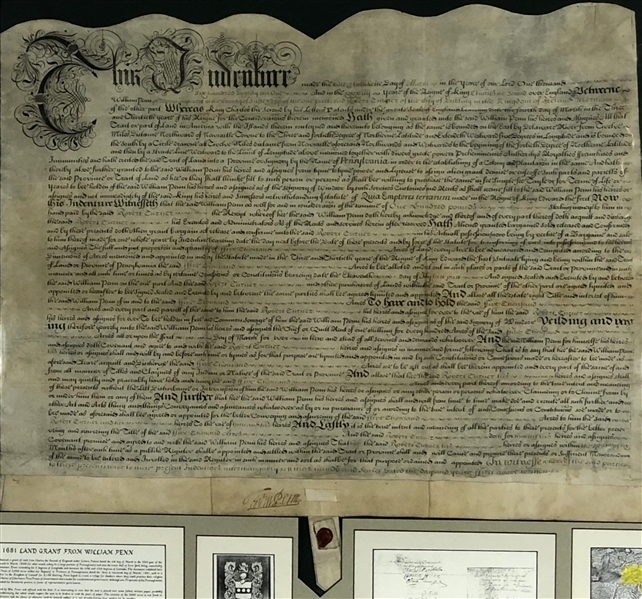 The day after the Pennsylvania charter was published, March 5, 1681, William Penn wrote to his friend Robert Turner in full: "...this day my country was confirmed to me under the Great Seal of England with large powers and privileges, by the name of Pennsylvania, a name the King (i.e. Charles II) would give it in honor to my father (i.e. Admiral Sir William Penn). I chose New-Wales, being as this a pretty hilly country, but Penn being Welsh for a head (i.e. pen), as Penmaenmawr in Wales and Penrith in Cumberland and Penn in Buckinghamshire, the highest land in England (this is not true), called this Pennsylvania which is the high or head woodlands. For I proposed, when the secretary, a Welshman, refused to have it called New-Wales, Sylvania, and they added Penn to it; and though I much opposed it and went to the King to have it struck out and altered, he said it was passed and he would take it upon him. Nor could twenty guineas move the undersecretaries to vary the name, for I feared lest it should be looked on as a vanity to me and not as a respect in the King, as it truly was, to my father whom he often mentions with praise. After recivieg the letter from Penn, Turner bought 5000 acres for himself and was active in getting other Irish Friends to buy. When the Free Society of Traders in Pennsylvania was formed in the spring of 1682, he became one of its heaviest subscribers, with £500 worth of shares. 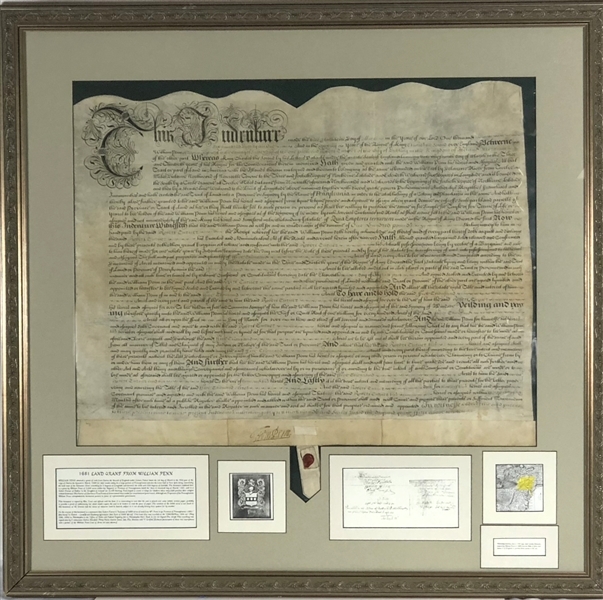 This is one of the first land grants,he gave 5000 Acres to ROBERT TURNER of Dublin, Kingdom of Ireland for L 100 Sterling on 23rd March 1681, making him a “First Purchaser.” Such a substantial purchase entitled an owner to an additional lot in the town of Philadelphia. Turner was also one of the original purchasers on West New Jersey as well. Any Land grants from this period are extremely rare and the fact the Turner played a very important part of the design and look of Philadelphia for over two centuries even gives it more importance. This land grant was signed more than a week before the king officialy proclaimed the grant to Penn on April 2, 1681. It is a Large Vellum Document, in very fine condition and bears a fine bold Signature of WM Penn with His Red Seal. 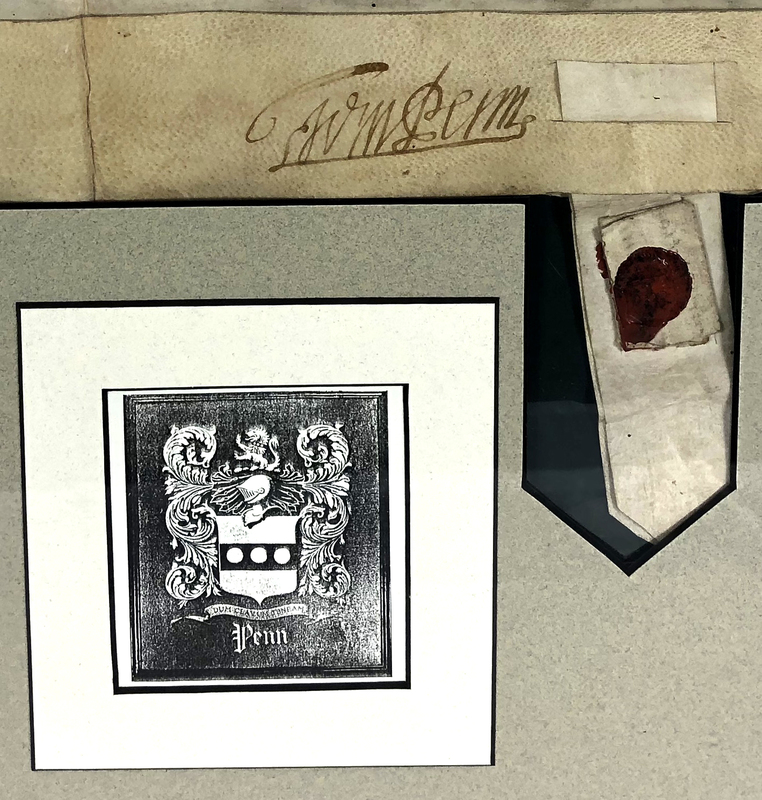 Also, Displayed in the frame are Penn's Coat of Arms, Map of Penn's Grant and Signatures of Witnesses. to it's registration in Philadelphia. Document is Framed and Matted to 34" x 35". Historical records of Pennsylvania show that the first brick house belonged to Robert Turner and was located at the corner of First and Mulberry (Arch) Streets. Robert was a wealthy merchant from Dublin who arrived in 1683 and had his house built in 1684-85. In the 1680's a small group of wealthy Quakers built Philadelphia from a cluster of huts in the wilderness to a rich and prosperous city. They were merchant princes of their day and vast landowners, but their names, unfortunately, mostly have been forgotten. One of the richest of these was Robert Turner, and there is a special reason why he should be remembered, since he set the architectural pattern of the city. For two and a half centuries, Philadelphia's streets were lined with houses of plain red brick, their generous doors and windows outlined in white, with white marble steps leading up to the slightly raised first floor. Their lines were simple and classic and they made old Philadelphia the most beautiful city in the New World. Turner was an intimate of William Penn. He became a freeman of the city of Dublin in 1672, and had already become intimate with other leading Quakers there, he had met Penn in Ireland, possibly on his first, and certainly by his second visit in 1669, for he is mentioned in Penn's Journal. He was interested in colonization; as early as 1677 he purchased one half of one of the hundred shares of the Quaker colony of West New Jersey, and in 1682 he became one of the twenty-four proprietors of East New Jersey. Penn's deed for Pennsylvania was signed on March 4th, 1681; on March 5th he wrote the news to Turner, who bought 5000 acres for himself and was active in getting other Irish Friends to buy. When the Free Society of Traders in Pennsylvania was formed in the spring of 1682, he became one of its heaviest subscribers, with £500 worth of shares. Historical records of Pennsylvania show that the first brick house belonged to Robert Turner and was located at the corner of First and Mulberry (Arch) Streets. Robert was a wealthy merchant from Dublin who arrived in 1683 and had his house built in 1684-85. In the 1680's a small group of wealthy Quakers built Philadelphia from a cluster of huts in the wilderness to a rich and prosperous city. They were merchant princes of their day and vast landowners, but their names, unfortunately, mostly have been forgotten. One of the richest of these was Robert Turner, and there is a special reason why he should be remembered, since he set the architectural pattern of the city. For two and a half centuries, Philadelphia's streets were lined with houses of plain red brick, their generous doors and windows outlined in white, with white marble steps leading up to the slightly raised first floor. Their lines were simple and classic and they made old Philadelphia the most beautiful city in the New World.